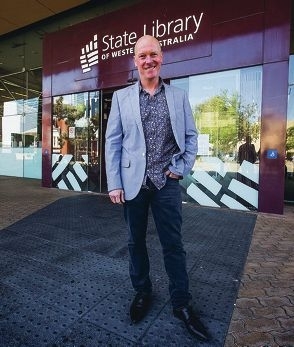 The producer best known for his work on Australia’s longest running TV series Neighbours and McLeod’s Daughters presented two classes at the Film and Television Institute’s (FTI) new home at the State Library of WA. Kingston said FTI had provided an important launch pad for his own extensive career. ‘FTI was always a place where visiting film makers would attend and hold talks,’ he said. Kingston emigrated from England to WA at the age of seven and grew up in Kalamunda, where he first discovered his passion for the arts. ‘I attended Kalamunda High School which had a great balance of curriculum, sport and art, including drama and the very early days of video production,’ he said. Kingston studied medical laboratory science at WAIT, now Curtin University, but his profound love for photography and the entertainment industry ultimately decided his career path. ‘Neighbours was obviously a mammoth project and it’s a machine that just keeps going,’ he said. ‘I also produced the feature Nerve in 2013 which was a real labour of love and is something I’m incredibly proud of. It seems Kingston’s talents also rubbed off on his son Oliver, who he will watch graduate from the WA Screen Academy at Edith Cowan University at the conclusion of his Perth trip.